Most phones these days are basically the same. A little gimmick here, a pinch of innovation there—but essentially they’re all identical. 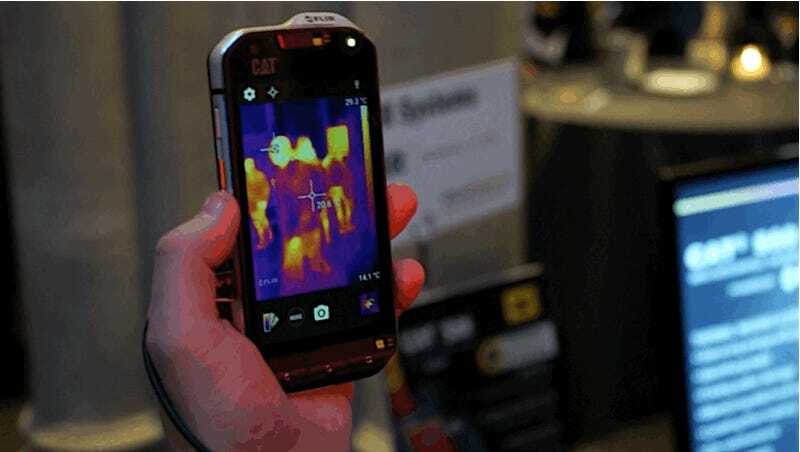 That’s not the case with the Cat S60, which is the first smartphone to have FLIR thermal imaging built in. We tried the little beast at MWC and boy, this thing is insane. First of all: This probably not your next phone. 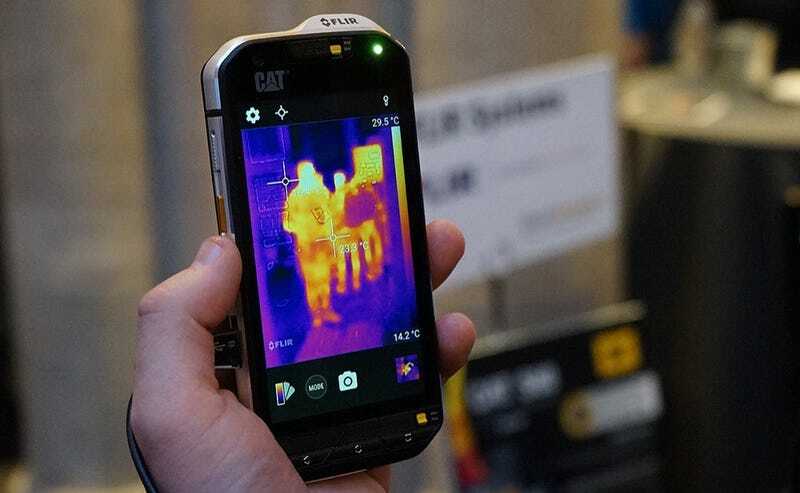 This is a phone designed for a small number of users, and unless you are an plumber, electrician, first responder, or something of the like, the S60 is just a rugged phone that lets you see the world like Predator. Which is really (really) cool, mind you. Looking ahead, the tech holds a lot of promise—the promise that one day, having a Lepton sensor—the specific piece of hardware that does all the magic—on a phone might not be an exception. This is how Predator sees me. Cool. What can a trained technician do with the S60 sensor? There are various use cases. For example, if you are at the scene of a car accident, you can use the FLIR camera to “see” through the smoke and locate wounded bodies. If you work with wires and electricity, locating hot and overheated areas is also pretty simple once you learn the basics of using the device. If you are a plumber, you can see where the heated water is leaking, or where an underground heating system is blocked. 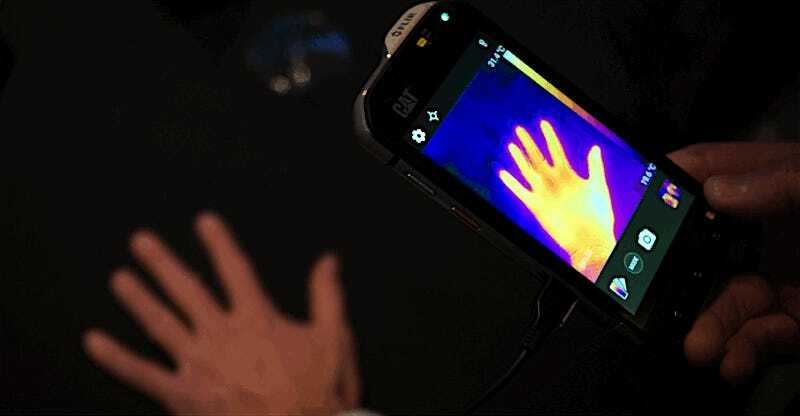 MSX technology allows the phone to combine the data from both the FLIR sensor and regular one. You can appreciate the architectural details in the background of the image. So this is a device for professionals. Sure! But it’s got features that are so cool that anybody can appreciate them. First, the image you see when you open the FLIR dedicated app belongs not only to the Lepton sensor but also to the regular camera. The phone combines the data from both of them to show you a live preview. This is incredibly useful because the FLIR image is usually blurry and weird, so combining the two gives you the best of both worlds. Thermal sensing point by point. Second, there’s a built-in software thermometer associated with the Lepton sensor so you can measure how hot or cold different areas are, just tap on a spot on your screen, and there you go. You can also tap different zones, and let the phone calculate the average temperature between them. Besides generating useful information, the hardware is also well-designed for tough situations. You can use the S60 with wet hands or gloves, and flipping switch on the device allows you to operate it underwater for up to an hour. What else? Here are some specs: It’s packed with microSD slot, 32 GB of storage, 3 GB of RAM a 4,7-inch HD screen. The CAT 60 runs Android Marshmallow. You can check the rest of nitty gritty here. So again, this is a niche phone built for a very specific set of people, but the nerd in us is delighted at all the possibilities. Cool as it is, it’s not a phone for everyone, and it won’t ever be. For now, Predator vision phones will be just incredibly awesome things that you know exist but don’t ever see.